Category: Originals by Fran Slade. Tags: Around Britain, Brighton, Countryside, FS landscape, Landscape, original painting, Summer. The steep scarp slope on the north side of the South Downs National Park overlooking the Weald. 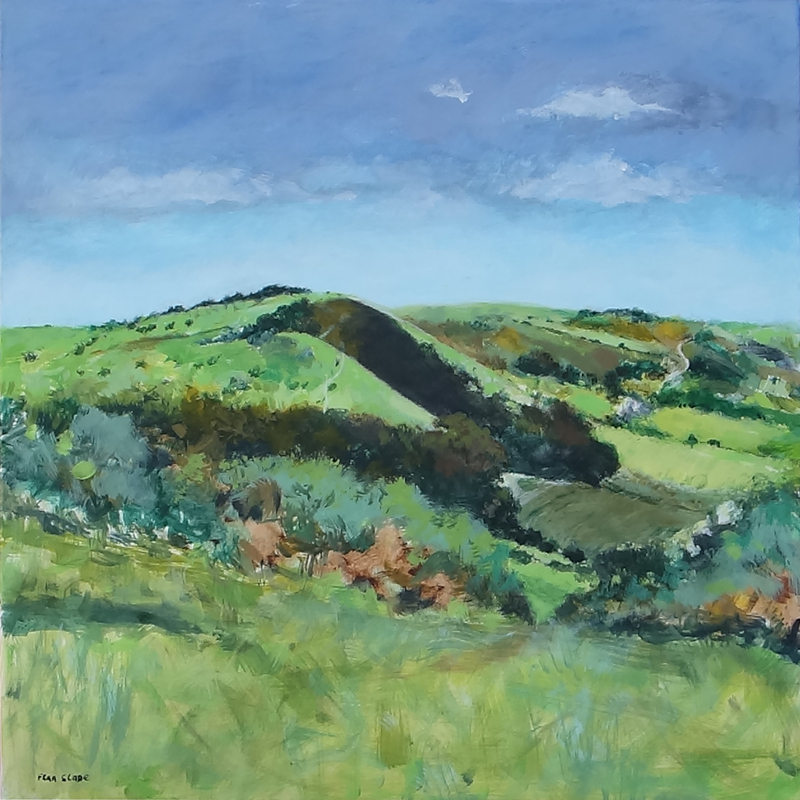 This is one of a series of original paintings inspired by walks on the South Downs in Sussex. SCARP SLOPE is also available as a print. Click here. Original paintings are one-off works of art. Individual originals can be part of a series where the artist is following a theme and creating a lasting body of work. The artist may use the unique original image to create a portfolio of prints, or licence the image for other use such as cards or calendars. The original painting, also know as the ‘master’, can become highly prized as it gets more licensed exposure. The value of original paintings is determined by gallery or auction sales, and can grow as the artist matures, and after the artists death. The status of original work is usually influenced by exhibitions, gallery shows, publisher promotion, and worldwide online exposure. Art lovers who collect original paintings should insure the work for the replacement cost to avoid insurance company quibbles. Original paintings will usually last for many generations and purchase information should be obtained and kept with the artwork where possible. Collectors and patrons who buy direct from the artist should make sure that their correct details are saved in the artist’s records.